2018 will be the last year in the Senate for Orrin Hatch. The Utah Republican announced today that he is retiring and will not seek re-election this November. Hatch has shaped some of the most meaningful legislation of the past 40 years, including that $1.5 trillion tax cut Republicans passed just before Christmas. His retirement also kicks off an open race for a safe Republican seat in the Senate. One potential candidate is former GOP presidential nominee Mitt Romney. Joining us now is NPR congressional correspondent Susan Davis. Hi, Sue. SHAPIRO: Hatch was first elected in 1976. He's the longest-serving Republican in the Senate. What's his legacy? DAVIS: He is one of only nine senators in the history of the country to serve for 40 or more years. There are few who have ever served in the Congress who have done more to shape modern American life than Orrin Hatch. In his retirement announcement, you could drop maybe what he said a little bit of a humble brag in which he noted that he's written more bills that have become laws than anybody serving in Congress today. Just to give you a sense of the scope of the things he's done - he was a chief author of things like the Americans With Disabilities Act, he wrote the nation's Children's Health Insurance Program law and he was a key author of the USA Patriot Act, which remade the national security apparatus after 9/11. He has cast votes for - in the confirmation process of every serving justice on the Supreme Court. And he also had a very prolific side life as a songwriter. He's written hundreds of songs over the years. He's a published songwriter and has written songs for the LDS church, of which he is a member, and has collected thousands of dollars in royalties over the years from that. SHAPIRO: How much of a surprise was his retirement announcement? I know President Trump personally appealed to him not to retire. DAVIS: For those of us who spend our days on Capitol Hill, it was not much of a surprise. His health has clearly been failing in recent years. He turns 84 later this year. There was a view that if they were to pass a tax cut bill, that that would likely increase his odds of retirement. They achieved that in - before they adjourned for Christmas. He said he wanted that sort of as a capstone to this legislative career. The president did engage. 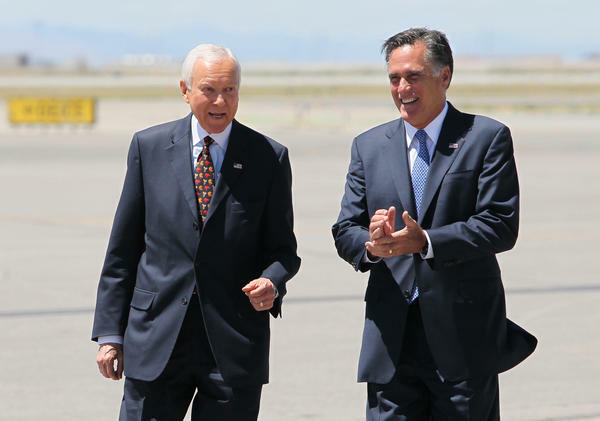 He did try to get Hatch to stay, to run for re-election, although that was often seen as maybe potentially an effort by the president to maybe elbow out Mitt Romney, who has not shot down the suggestions that he should consider running for that seat - and even Orrin Hatch, who has suggested that Mitt Romney could be a good Senate candidate to replace him. SHAPIRO: And Romney, of course, has not been a friend to President Trump, criticizing him quite openly. How serious is the idea that he might run for this seat? DAVIS: He has not made any official announcement. He only put out a statement today congratulating Hatch on his career. There has been speculation around this for months, and Romney has done nothing to dissuade the talk, which is fueling speculation that he's in. He's wildly popular in Utah. He'd be heavily favored to win if he gets in. As you noted, he's been a very vocal critic of the president, so having him in the Senate could be a very interesting dynamic. This would be his second bid for Congress. He ran against Ted Kennedy in 1994 in Massachusetts for the Senate and lost. Utah in 2013 is probably more hospitable ground, and he has until March 15 to make up his mind, although he'll likely make a decision well before then. SHAPIRO: NPR's Susan Davis, thanks so much. (SOUNDBITE OF BONUS POINTS' "HAMMOCK DAYS") Transcript provided by NPR, Copyright NPR.